Experience "the world of tomorrow" and witness the "dawn of a new day". These were the slogans of the 1939 New York World's Far (NYWF). The event was held at Flushing Meadows-Corona Park, which up until then was an ash dump (the largest ash pile was so big, some 90 feet tall, that it was actually given a name - Mount Corona). The event was conceived in 1935 by a group of New York businessmen in order to help lift the city and the country from the doldrums of the Great Depression. From offices high up in the Empire State Building, the committee imagined the biggest international event the world had seen since the horrors of the Great War. The theme of looking towards a bright and peaceful future full of scientific wonders was more relevant than ever in the current climate. In all, it took four years for the NYWF committee to bring their colossal vision into the realm of reality. The date chosen for the grand opening of the fair was Sunday, April 30, 1939, the 150th anniversary of the inauguration of the first President of the United States, George Washington. The opening speech was to be given by the current President, Franklin D. Roosevelt, in front of a crowd of 206,000 people. But this was to be no ordinary speech. Since new technologies and future innovations was the central theme of the fair, this was the perfect opportunity for RCA to introduce a new thing called 'television' to the public. Roosevelt's speech was not only broadcast by radio, but it was actually televised. It is said that some 1,000 people watched the speech on 200 television sets scattered around the New York metropolitan area. In fact, many events throughout the course of the fair were broadcast on television. The speech coverage was used by the New York station W2XBS (now WNBC) to inaugurate their new system of regularly scheduled broadcasts in the New York area. Anticipating skepticism among the public, RCA set up a television in their pavilion with a transparent case so the internal components could be easily seen. Also, in this pavilion (one I would have made a beeline for if I were there) a mini-studio was set up allowing people to see themselves on television. People could also see television demonstrations at the General Electric and Westinghouse pavilions. Innovative architecture was for the various displays and pavilions was highly encouraged. Architects had nearly free-rein to be as "creative and energetic" as possible with their designs. Perhaps none typified the stunning vision for the future more so than the Theme Center, designed by Wallace Harrison and Max Abramovitz. This center "consisted of two all-white, landmark monumental buildings named the Trylon (over 700 feet (210 m) tall) and the Perisphere which one entered by a moving stairway and exited via a grand curved walkway named the "Helicline". Inside the Perisphere was a "model city of tomorrow that visitors" viewed from a moving walkway high above the floor level." (Wikipedia). Some of the highlights of the fair included exhibits featuring nylon fabric, Secentovision (a forerunner to Smell-O-Vision), and an exhibit featuring what was perhaps one of my favourite toys as a kid, the View-Master (remember those?). People could also see a new futuristic car design in the General Motors pavilion. There was even a talking robot that - you wouldn't believe it - actually smoked! As the song goes: "it's all happening at the fair!" On 10 May 1939 an omnibus set of two stamps of a single design was issued in twenty-four French colonies to celebrate the New York World's Fair. 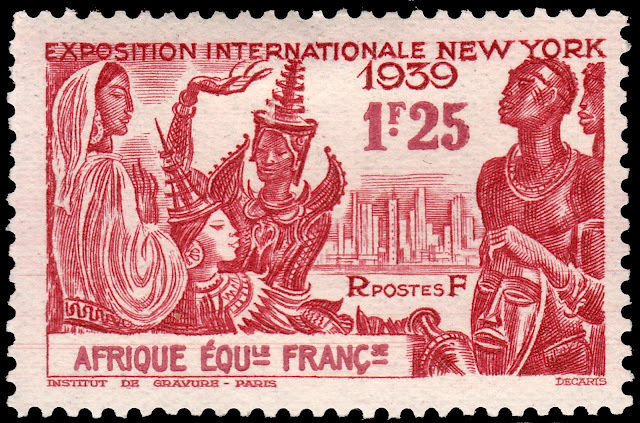 The stamps were designed and engraved by Albert Decaris. This was Decaris' second foray into omnibus stamp design, the first being the 1937 Paris Exposition set. Below is a list of all the colonies in which this set was issued (it should be noted that these stamps are available with several different overprints, but I'll leave that for another time). 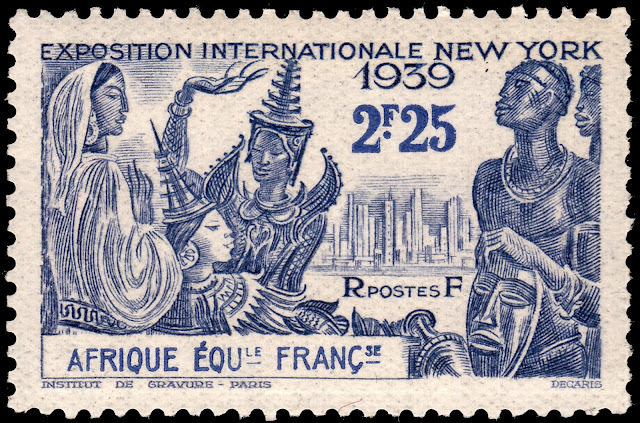 Of course, it would be difficult to display images of all the stamps of all the colonies, so considering I am in the process of studying Albert Decaris' work for French Equatorial Africa, I will showcase those ones here (in the future, I will be doing separate blog posts for each of these omnibus issues).